The questions and discussion topics that follow are intended to enhance your reading of With Friends Like These. I hope they will enrich your experience of this novel and perhaps be used to spark a group discussion. 1. What lessons about friendship can be learned from this book? 2. The author tells the story in rotating chapters featuring the first-person voices of Chloe, Jules, Quincy and Talia. Why do you think she chose this structure? Do you feel it achieved the purpose she had in mind? 3. Which character did you most relate to and why? 4. A review in Publishers Weekly describes the books’s scenarios as “achingly real.” Do you agree or disagree? 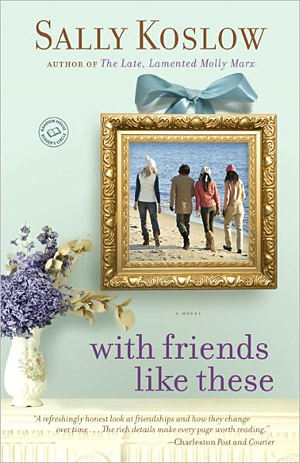 Do you think this novel offers a fair portrayal of friendship as women have experienced it in the last fifteen years? 5. What obstacles do you think most often complicate women’s friendships? Are men’s friendships different? 6. Have you ever experienced a friendship-related problem similar to any in With Friends like These? How did you resolve it? Were you able to maintain the friendship or did it disintegrate? 7. For most of the book, the characters live in or near New York City—suburban Connecticut, Brooklyn and Manhattan. Do you think the scenarios experienced in With Friends like These are universal or specifically urban? 8. Do you think that friendships are more difficult to maintain now than when your mother was your age? Your grandmother? Why or why not? 9. What are the characteristics of a “close” friend? How many people in your life do you put in this category? 10. Do you feel that social media like Facebook helps or hurt friendship? 11. Do you have any rules for friendship? What are they? Did you learn any of these rules the hard way and if so, how? 12. If you have read either of the author’s earlier books (The Late, Lamented Molly Marx or Little Pink Slips), how does this novel compare?